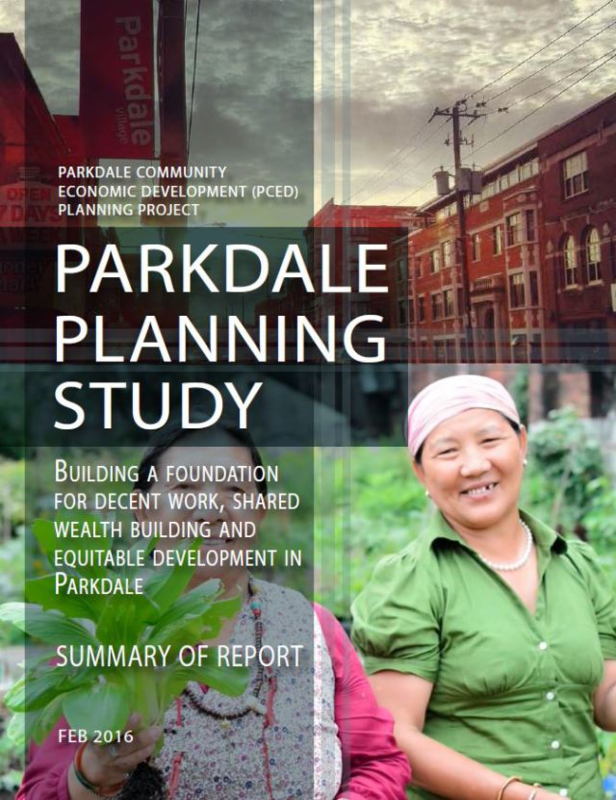 Parkdale Village has experienced transition more than a few times in its 140 years. Today, it is home to a working-class neighbourhood, with a mix of low and high income residents, as well as new immigrants, artists and young professionals. The diversity and creativity of the area has led to a thriving neighbourhood and destination of choice for its estimated 50,000 residents and visitors alike. 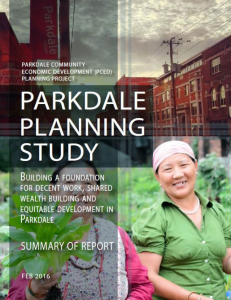 Another community project the BIA supported is the Parkdale Cycling Study which highlights the economic importance of cyclists and pedestrians to the area. As well, the Urban Garden Development Project and its reinvigorated community gardens and historical plaques, help illustrate where Parkdale Village has been and where it is going. Learn more by watching the Parkdale Village BIA & TD Green Streets 2013 Project Documentary below or click here to read the article. Although the Parkdale Village Business Improvement Area (PVBIA) encompasses the area along Queen Street West from Dufferin Street to Roncesvalles Avenue, Parkdale Village itself includes parts of Roncesvalles Village. The Village of Parkdale was proclaimed a municipality in January 1879; it became a town in January of 1886 and was annexed by the City of Toronto in March 1889. Although the village celebrates over 140 years, the settlement of the area predated its foundation. In 1812, the 240 acres of land bounded from Lot Street (today’s Queen Street) on the north, Jameson on the west and Dufferin Avenue was granted to James Brock, the cousin of Sir Isaac Brock, in lieu of salary. Brock did not occupy or improve the land during his lifetime. After Brock’s death in 1830, his widow Lucy Brock sold the lands which became the major part of Parkdale to John Henry Dunn and William Gwynne. The area north of Queen Street was subdivided from the O’Hara Estate, given to Walter O’Hara for military service. Another parcel of land north of Queen given to James Brock, east of the O’Hara estate, was developed along Brock Avenue, and became Brockton Village. Dr. William Charles Gwynne, one of Parkdale’s early settlers, built his family home (which he called “Elm Grove”) on this land in 1833. 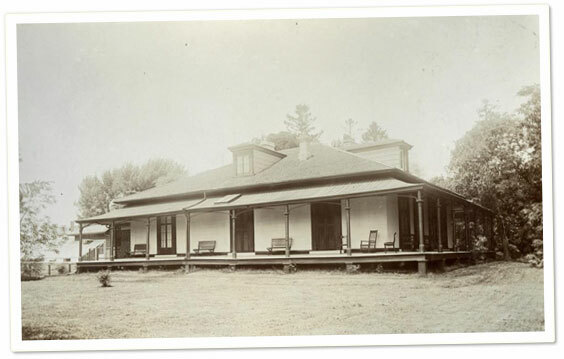 Pictured here in 1898, “Elm Grove” was the name of this cottage owned by the Gwynne family. “Elm Grove” stood on what is now Dufferin Street, and was demolished in 1917. Upon Gwynne’s death in 1875, his land was subdivided and placed on the open market. Several new streets were laid out at this time, including Greig Street, which is now called Elm Grove Avenue. 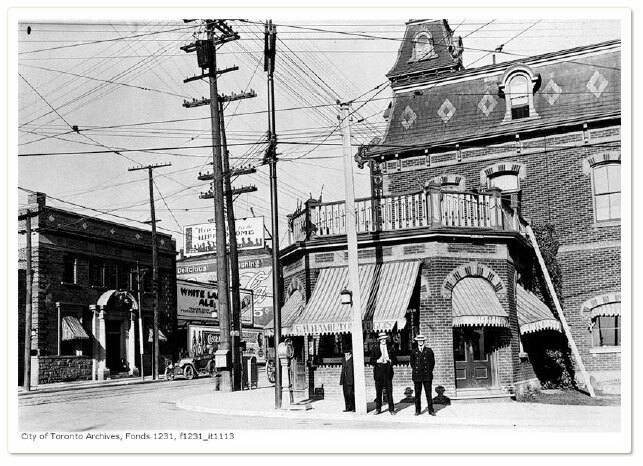 In 1888, a building located at the south west corner of Queen Street West and Cowan Avenue was built to accommodate Parkdale’s first police and fire department. 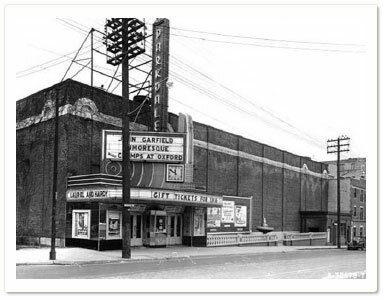 In 1931, the building that now stands at 1313 Queen Street West was built in its place. Today, it is home to the Parkdale Village BIA office, as well as numerous non-profit organizations and arts workers. 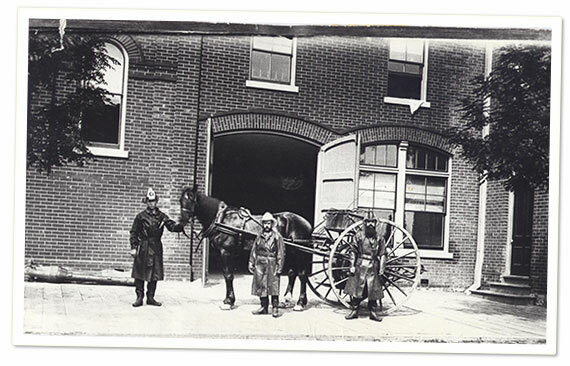 Above, three firefighters stand in front of the Parkdale Fire Department in 1888. They are shown with their horse and harness, purchased for the fire department by Parkdale Council. Colonel Walter O’Hara (1789 – 1874), one of Parkdale’s earliest settlers, who once owned this land, was born in Dublin, Ireland. A career soldier, he served in the Napoleonic Peninsular War, and arrived in Canada in 1826. He was Assistant Adjutant General of the Upper Canada Militia with the rank of Colonel from 1827-1846. Walter and his wife Marion accumulated over one hundred and twenty hectares of land in Parkdale between the years of 1831 and 1840. Their home, an imposing Georgian-style building named “The West Lodge”, stood at the head of the street of that name until it was demolished in the 1960s to build the May Robinson Apartments. 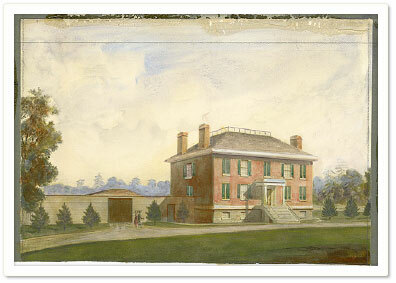 Colonel Walter O’Hara’s son, Robert, painted this view of the family’s estate, named West Lodge, which was located just north of Queen Street and east of Lansdowne Avenue. There are many streets in Parkdale named for O’Hara family members or places linked to them. The only two named by the Colonel himself date back to his 1856 subdivision of Park Lots 33 and 34: Roncesvalles and Sorauren Avenues. These names refer to the sites of battles in Spain in which he fought (in the years 1813 and 1815, respectively). Because of its close proximity to the lake, Sunnyside Beach and the CNE, Parkdale was once a resort spot for Torontonians, with beautiful summer homes nestled among lush trees and plants. The land was covered in forests of sugar maples, beech, yellow birch, white ash and hemlock. The name Parkdale, fixed upon in the 1870s, was meant to convey images of decorative gardens and fertile country-side. 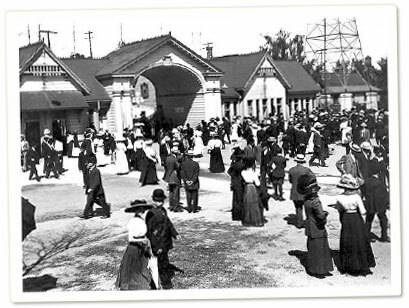 Above, is the Canadian National Exhibition ‘Dufferin Gates’ entrance in 1908 located at the foot of Dufferin Street. 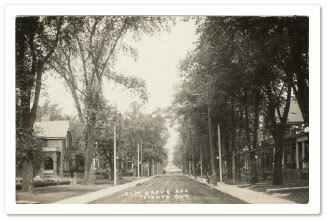 Above, Elm Grove Avenue, looking north from King Street West to Queen Street West in 1910. 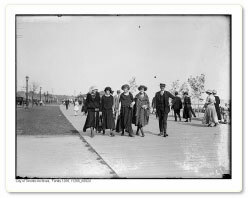 Strolling the waterfront in 1923. In 1812, 240 acres of land surrounding Lot Street (now known as Queen Street) between Jameson and Dufferin Avenues were granted to James Brock for his military service. Upon Brock’s death, his widow Lucy Brock commissioned a roadway along the centre-line of the length of the lot parcel. This road, built in 1850, is known today as Brock Avenue. The Development continued into the 1850s with the rail line built along the lake and a train station at the intersection of Springhurst and Jameson Avenues. The addition of these new streets transformed Parkdale from a quiet rural settlement into a small incorporated village. 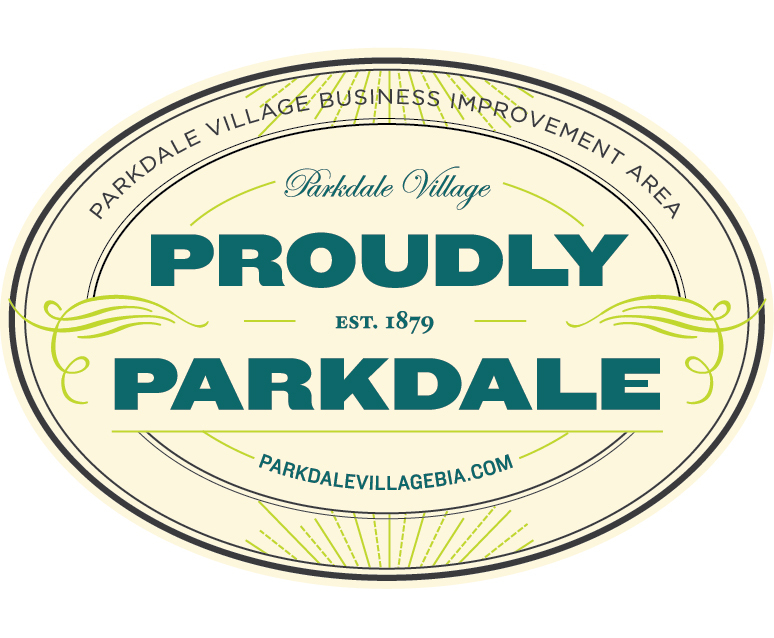 By 1883, Parkdale’s population doubled in size and the corporate seal of the town of Parkdale was created in 1886, as seen above. In 1852, writer W.H. Smith described Brock Street as “a cluster of houses, three of which are taverns”. Until the late 19th century, this street was the centre of Parkdale’s social and commercial activity and was the main north-south route. 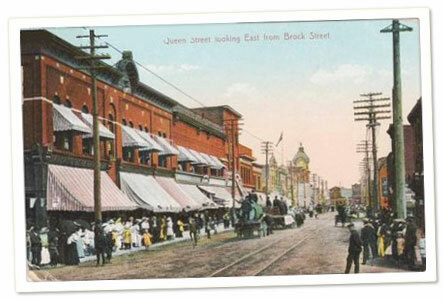 Above, a bustling Queen Street West, looking east from Brock Avenue in 1910. Above, Queen Street West, looking east from O’Hara Avenue in1905. The Union Meat Market stands on the left. Over the years this stretch of road has had many names: Niagara Road, Burlington Road, Lot Street, and Lake Shore Road. Its current designation, Queen Street, was first used in 1859. 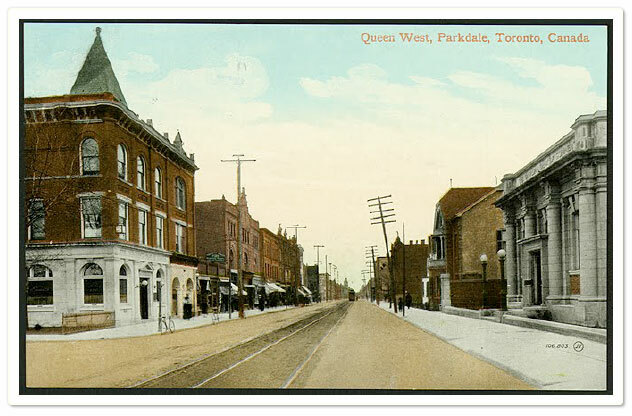 By 1878, Queen Street emerged as the main thoroughfare of Parkdale. 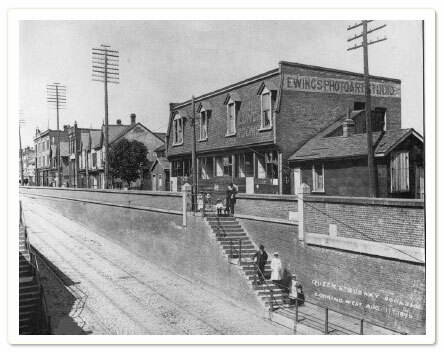 Above, the northwest corner of Queen Street West and Dufferin Street, formerly Queen Subway Station in 1896. Above, the Union Meat Market, northeast corner of Queen Street West and O’Hara Avenue, circa 1890. This building still stands today, minus the conical tower and roof adornments. Above, Ocean House Hotel at the junction of Queen Street West, King Street West and Roncesvalles Avenue in 1914.This building still stands today. The Parkdale Theatre, southwest corner of Queen Street West and Triller Avenue. 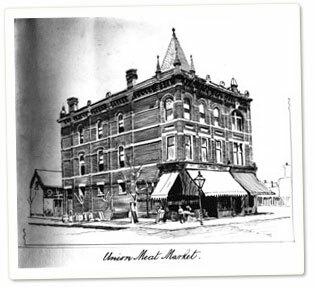 This building still stands today; it is home to a bustling antique market. If you would like to read more about Parkdale Village and the surrounding area, please visit the sources below. If you have any historical photos, documents or stories about Parkdale Village, we would love to hear from you! Additionally, for more historical details visit our four (4) historical plaques and gardens along Queen Street West, courtesy of TD Friends of the Environment Foundation (TD FEF), Tree Canada and TD Green Streets.